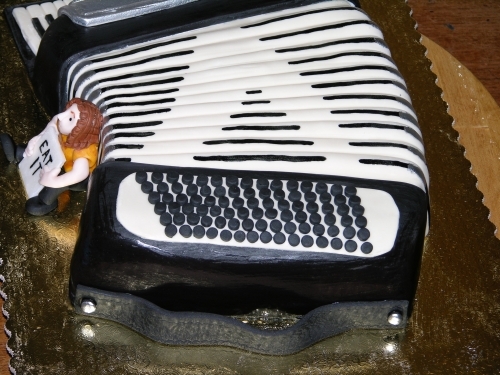 On Saturday I posted a quick pic of the accordion cake I made for Weird Al Yankovic. Here are more details about that, including some in-progress photos so you can learn to make your own. First of all, let me make a few things clear: I obtained permission to do this in advance, I was professional about it, and I’m not advocating celebrity stalking via baked goods. Let’s cover the basics, shall we? Make nice, proper, sensible things to celebrate your fandoms. Send celebrities anything you’d be freaked out to receive from someone you don’t know. Use official means of getting your creations to celebrities. In this case, I phoned the venue ahead of time, asked permission to bring it, and they confirmed that they’d asked Weird Al’s people if it was okay. They warned me that it might be ignored, but permission was fully granted. If you’re mailing something, use a proper fan-appropriate address such as their agent, studio, etc. Surprise venues, celebrities, or staff with unexpected items, especially food. If someone you didn’t know brought you unexpected food, would you eat it? Never approach a celebrity’s home or family, or try to weasel your way in through unofficial doors. Make clear your credentials, identify yourself fully, and in all other ways show yourself to be a sane* and trustworthy person. In this case, the venue has a PBS show at the same station as the PBS show for which I volunteer and frequently bake, so I told them I had those folks as references if needed. I also put my card on the cake box with my contact information not because I expect Weird Al to call me up and chat, but so if there’s any problem or question, I’m clearly a real person who can be talked to. Lie about credentials or send things anonymously or with a fake name. Again, wouldn’t you be spooked by food sent to you anonymously? Get a total giddy thrill when the celebrity acknowledges what you sent them (or in this case, tweeted what I was about to bring). Expect them to acknowledge it! Do not use the gift as a request to meet them! I made it clear to the venue folks that I was not trying to meet Weird Al and at no time did I ask to or for favours, acknowledgement, or anything other than confirming that the cake would be passed on. I’m thrilled that he tweeted about it but that’s a bonus, not an expectation. In sum, don’t do anything that makes you look like a creepy stalker, which Al himself so wonderfully captured in the song, “Do I Creep You Out?”. If you still need more clarification, go read Alton Brown’s “Fanifesto”. 1) Bake a 13×9 cake, one standard box mix’s worth. Let it cool completely. 2) On a cutting board, cut the cake into the basic shape thusly: taper the short sides on a diagonal, cut a small curve on what’s now the smaller of the two long sides, and cut the remaining longest side into a curve. See the diagram in step 4 to clarify. Level if necessary (I didn’t have to with this cake). 3) Put a bit of buttercream in the center of your presentation board. Put the cake on the board ensuring that there’ll be enough room for the keyboard portion later (i.e. the cake should appear off-center at this point). 4) Cover in a crumb coat of buttercream, then chill. 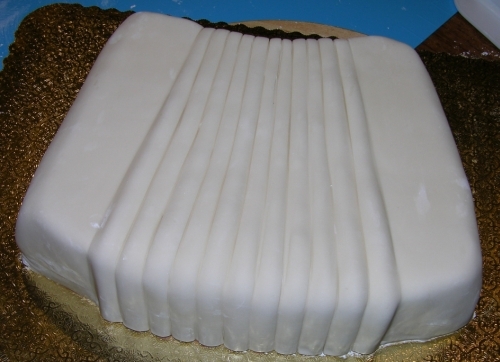 Once firm, add more buttercream to create the accordion box edges, the rounded curves at the ends, and provide a thicker layer over the bellows area. Then use the backside of a butter knife to draw lines in the bellows area. Use whatever method works for you to get them relatively even; I prefer to start in the middle, then mark quarters, then eighths, and so on until the tighter side is as full as possible. Be sure to make the lines down all sides of the bellows as well, keeping their spacing even as they radiate outward on the wide side. Cutting diagram and first buttercream shaping. Cut along the dotted light green lines. All the cake between the yellow lines and the dotted green lines is scrap, which means you can eat it. 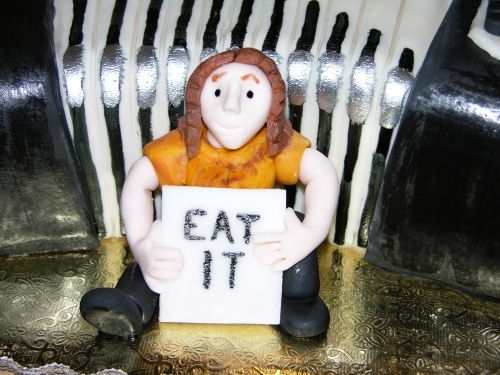 Feel free to pretend you are thus eating cake with Weird Al. Imagination is fun! Put it back in the fridge to chill that layer of buttercream. 5) Pipe some buttercream with a medium round tip (I used a 7) over the bellows lines to make them higher. It doesn’t have to be perfect because it’ll squish a bit under the fondant, but this will help you form the ridges later. I made mine taller toward the wide end where it had room to spread under the weight of the fondant later. Too much at the narrow end will prevent you from forming the pleats on that side. Put it back in the fridge one more time to completely harden up. 6) Measure the sides and top of the cake to determine what area of fondant you need to roll out. For this part I used Fondx instead of my usual homemade fondant; while I don’t like Fondx for any application where I want it to firm up (such as making figures), it’s great for any situation where you want extra time to work, such as draping or shaping. Roll it out at 1/4″ thickness, get the cake out of the fridge, spritz it with some water to make the buttercream tacky, then transfer your fondant over the cake. Smooth the sides, pull out any pleats, and trim as usual. Then use the edges of your smoothers (or a similar edged sculpting tool) to gently work the fondant around the bellows lines. Don’t force it too fast or it will rip! It doesn’t have to follow your original lines precisely; just work it in as evenly as possible. Once the low points are pushed in, gently pinch the high points to bring them up a bit. 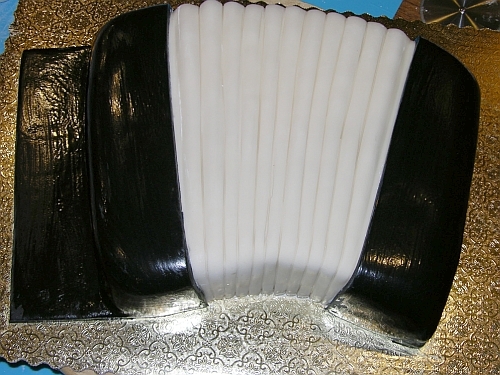 The accordion I was replicating has black edging that makes an arrow pattern, so I wanted those edges to come up as far as possible given the elastic nature of the fondant that tends to always droop back into a rounded position. By pinching it up the edges were higher (even after settling) than if I hadn’t pinched at all. The cake with the white Fondex over it. The sides will be covered with black but by covering the whole cake first, not only is it more structurally sound, but the sides will come out flatter and higher, plus there's no worry about seam lines or buttercream leakage. 7) Measure the sides, taking care to measure extra for the keyboard area (if you’re unsure of the proportions, measure on your photo(s) and calculate the ratio). Roll out more fondant of the appropriate colour (in this case I used black Satin Ice) at 1/4″ thickness again, cut to the right size, dampen the white fondant on the cake so it’s sticky, then put the black sides into place. On the keyboard side, brush a bit of water on the board as well so it’ll stick. Smooth and trim as necessary. The black fondant is shiny because it had cornstarch on it from rolling, which I typically remove with a damp brush. This does make it look wet for a short time, but this was the day before so I knew it'd dry to look clean and smooth later. Cut the red line labelled 1 first. Then cut the green lines labelled 2 next. Then cut the black lines labelled 3. You will now have eight sections. 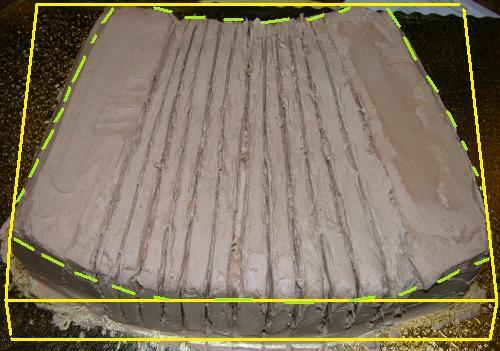 Cut each section into thirds as indicated by the blue lines. Incidentally, this is the same way I cut the keys on the miniature piano on my Musical Mice cake, albeit more of them and with an xacto knife. 9) Cut 17 small black bars to fit on top of the white ones and affix with water as shown in the photo (or using the photos of the accordion you’re replicating as a guide). If your little black bars are floppy, be sure to straighten them as you place them by pushing gently against the sides with a straight-edge. 10) Apply any other decorations on this side as required. As far as I could tell from photos, this accordion has a shiny silver bit more or less this shape, so I made that in white, textured it with a mat, indented a border, added the embellishments, and then painted the whole thing with edible silver dust mixed with clear vanilla. There are also five large white buttons which I think have writing on them but I couldn’t find a good picture of that, and I was running out of time, so I just left them blank to give the overall look. 11) If the bellows have any decorations, add those. In this case, that meant painting black food colouring gel along the edges in the pattern shown. When that was dry I painted silver corners on both sides. 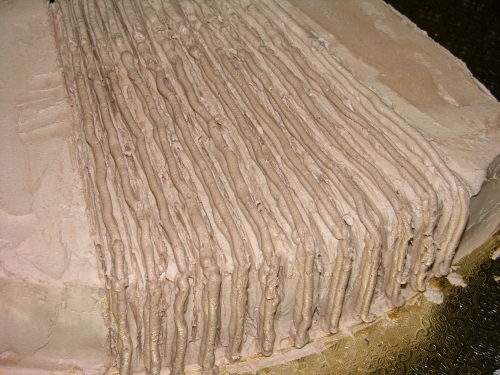 The lines suggest the tighter pleats without having to force the fondant to stay that way. 12) For the other side, apply a white panel and then cover it with small black buttons. In this case Al’s accordion has six diagonal rows of 20 buttons, but I couldn’t fit that many on without making them insanely tiny, so I fudged it and went for six rows of 15. Again, it evokes the general idea even if it isn’t 100% accurate, and I think this looks better aesthetically than a bunch of tiny dots crammed in. I used a miniature circle cutter but if you don’t have one, you could roll a log and cut it, then gently roll each piece between your fingertips to round it. They’re affixed with water and stuck very well (so well that whenever one landed out of alignment it was a bit of a pain to move it around). I originally planned to add more of the various straps and buckles as per the photos, but as time got short I decided to just do this side strap because it’s important for operation of the instrument. It is simply a strip of black fondant cut to size with quick faux seam lines made with a fluted pastry wheel. I stuck it on the case with water, plus a bit on the board to hold it there as well, then added two quick little blobs as rivets and painted them silver. Roll your strap thick enough that it'll stand up fairly well without flopping over. That’s it for the accordion! 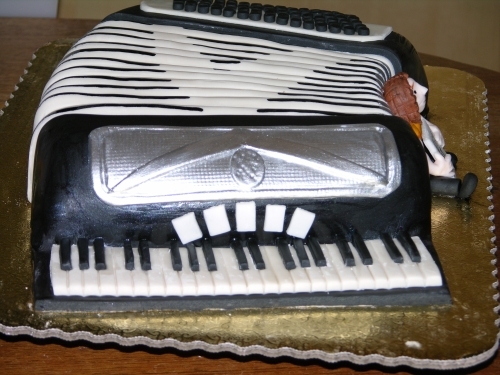 During the show when he used the accordion on which this cake is based, I found myself wanting to study it as if I was still making the cake. I’m that much of a cake nerd. It was amusing to me how many people replied to Al's tweet pedantically explaining this incredibly obvious joke. If you want to add a little Weird Al figure, or one representing someone else, just follow my Figure Modelling 101 tutorial here (this figure was made on the template at 4.25″ tall). In this case I made the sign a day ahead so it could dry hard and be a support for the arms (which still came out a bit oddly floppy). The hair was made in two sheets, each cross-hatched with the side of a needle tool, and then the edges indented as well to suggest Al’s wicked curls. I did one normal eyebrow and one a bit raised to give him a quirky expression. Al has a prominent chin and a thin face so I pulled the chin down a lot so as the fondant settled the face would have a shape closer to the real thing. I will probably never know if Al and his entourage ate the cake or not. I did bring a bag of forks and napkins to encourage it. Either way, he seems to have enjoyed it enough to tweet it which is more than enough for this proudly “Canadian Idiot” fangirl! * For values of sanity indicating the kind of person who idolizes Weird Al to begin with and is also drafting another blog post about experiments in gummy to look like zombie-skin-cakes. Look for that one this evening. It’ll be as gross and awesome as it sounds, muahahaha. This entry was posted in Cake Decorating, Donated Items, Fancy cakes, Severe Nerdery. Bookmark the permalink. Fantastic! I made a cake for Al. I've been giving him goodies since we first met on April 27, 2002. He did not know I was bringing anything that first time, but accepted them just the same. Now he kind of expects me to bring treats, so I really don't have to ask. 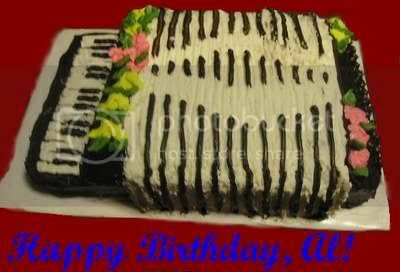 I made him an accordion cake, but mine was not nearly as nice as yours. He still liked it, though. (I was able to give it to him personally). Mine was all done in buttercream. Sadly, it got smushed a bit before he saw it, but it looked like this – http://i47.photobucket.com/albums/f191/algonacchi… Anyway, thanks for your tutorial, and maybe someday I'll play with fondant. Awesome! And yeah it's different if you're a known person…I bring stuff to the Biscuit Brothers all the time without checking first now, but even that started with a respectful request to do some knitting based on their show a couple of years ago. Yeah, I'm sure they appreciated you asking first. Some of my treats are in the gallery at weirdal.com, too. 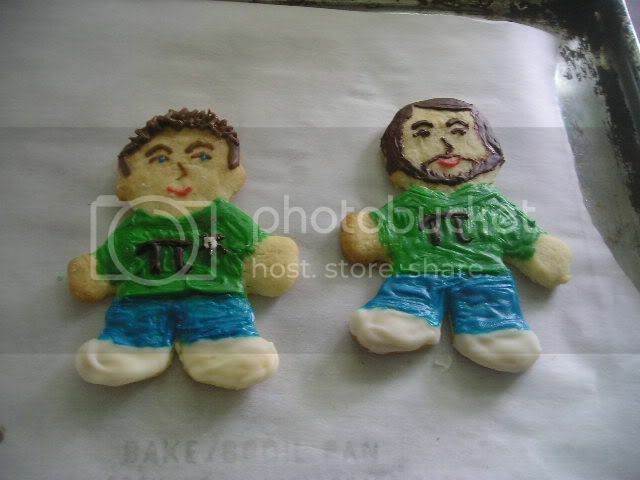 I've made cookies and candies for Al and cookies for Chris Hardwick and Mike Phirman, too. All appreciated, and all those guys are really nice. Chris and Mike – front – http://i47.photobucket.com/albums/f191/algonacchi… and back – http://i47.photobucket.com/albums/f191/algonacchi… Mike said "that's when it's art" when he saw they were decorated on both sides. Chris said he didn't want to eat his because it was so cool.. Aww. The cookies are adorable! And yes, doing the back is awesome. 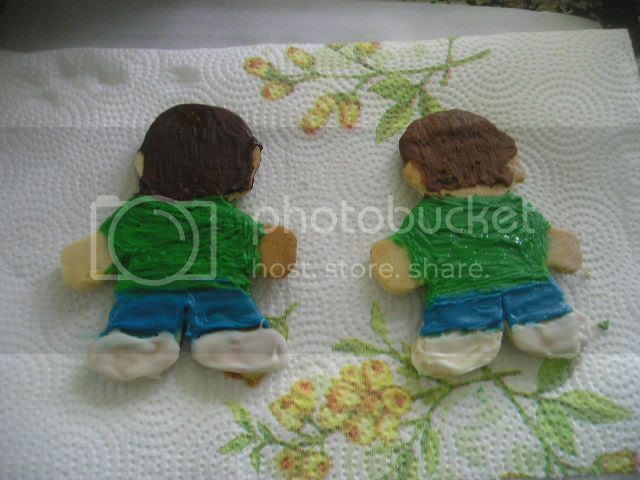 I freaked a lot of people out with my 2010 showcake when I not only covered the undersides of the floating boards with fondant but also included little jokes on them. This is excellent! That cake is amazing and your do's 'n' don'ts list is very educational, And I'm glad that you posted the 'dont's' because I was thisclose to baking a cake with myself inside it for Neil Gaiman. Also he'd probably let the dogs eat it and then you'd be totally hosed! Silly! I would leave a few air-holes for myself! I'm not *that* stupid. Oh I didn't realize you had it that well-planned. By all means then, proceed, and be sure to take photos for blogging later! That is just a beautiful cake. 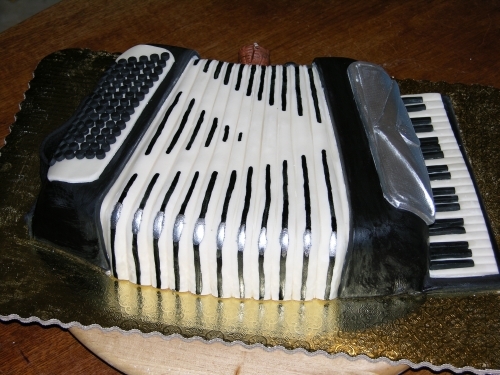 You have set the bar incredibly high as far as accordion-shaped baked goods. And I'd think chances are excellent that Al and/or band and/or crew and/or their aftershow guests ate it, since you went out of your way to present it in as non-scary, non-stalkery a way as possible. And if you ever do have a chance to meet Al (he does sometimes do impromptu meet & greets after shows) mention the cake. He will remember it.